Vampire Beauties: Vampiress Review: "The Vampire Doll"
Vampiress Review: "The Vampire Doll"
The Gist: A girl and her boyfriend go in search of her brother who has gone missing after going to visit his girlfriend. Clarification: It's your basic hammer horror inspired people go into a remote location where there's a creepy house that has monsters as residence and then those people have to escape, film. 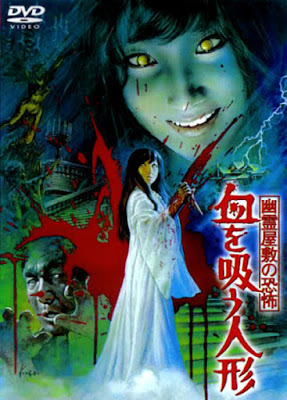 It's the first of the three films of the japanese "Bloodthirsty Trilogy"
Female Vampire Factor: The girlfriend in this case has been turned into a vampire. The thing is she doesn't have fangs and she generally tries to kill throughout the film using standard murderer methods. Out of the bloodthirsty trilogy films I'd say this is least vampire related but since it's the first of the three it's understandable and the films get more traditional with the vampires as they go. I give this one a Vampire Beauty Rating of 2 out of 5. If you're just interested in this series of films for the female vampire factor skip this one and just watch the other two. Otherwise as far as straight forward old school horror goes it's pretty good.